Two courses are available: 'The Foundational Flow' and 'Therapeutic Thai.' It is recommended to start with the 'Foundational Flow' course to learn the full treatment and then add in the more creative and advanced stretches found in the 'Therapeutic Thai' course. The two together cover all the material taught in my certification training. For CE's and certification, one must take my live 'hand's on' courses. These materials are designed to be a supplement to my hand's-on training courses, but they can also be purchased and used to learn the techniques on your own. Choose between an online version or a physical hard copy (DVD) version. The online version has additional resources (recorded live at trainings) to broaden your understanding. Prices below include all taxes, shipping & handling in the U.S. This option includes both the 'Foundational Flow' DVD and the corresponding manual. They will be mailed directly to you. Includes: All seven sequences and techniques with instruction and additional notes. Also included: bonus sequence; theory pages; intake form & Thailand resources. This option includes everything...Both manuals and both DVD's will be mailed directly to you and you will have free online access to all the material, including all the bonus material. 2) Online Access to both the 'Foundational Flow' and the 'Therapeutic Thai' instructional manual. This option includes the physical 'Therapeutic Thai' DVD only. This DVD covers a full body 1-2 hour Thai Yoga Bodywork treatment focusing on more advanced Thai Yoga stretches and Therapeutic principles. This DVD was recorded live at 'hands-on' workshops in 2013. CE's & certification are only available w/ 'hands on' courses. 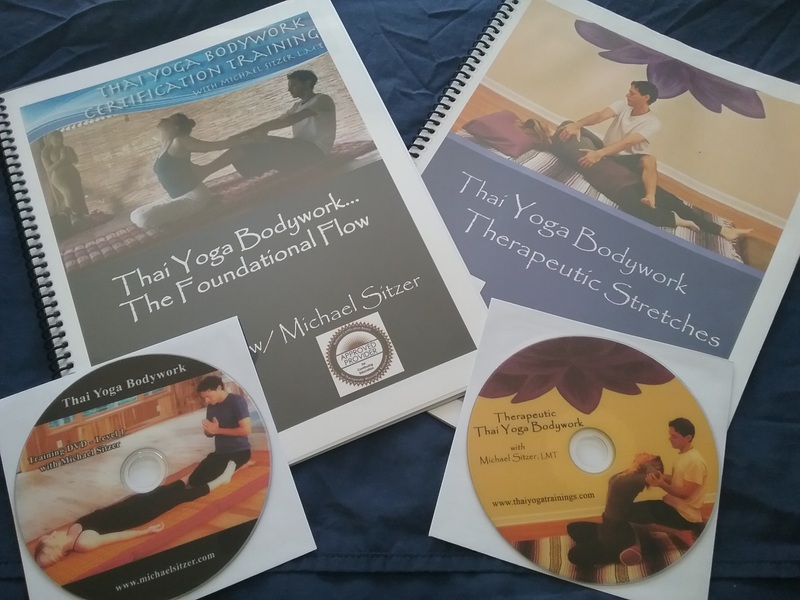 This option includes both the physical 'Therapeutic Thai' DVD and the corresponding instructional manual...This course covers a full body 1-2 hour Thai Yoga Bodywork treatment focusing on more advanced Thai Yoga stretches and Therapeutic principles. Recorded live at a hands-on training in 2013. This option includes full access to all the online material. No physical materials will be mailed. 1) Additional video instructional guidance for each sequence. These were recorded at one of my 'live hands-on' workshops. "I am so enjoying all the videos. I just finished 40 CEU's in Thai Massage. I felt I had a mechanical understanding of many of the moves, but something was missing. I just didn't FEEL anything. My Thai Massage had no flow, no heart. Just a couple days with your videos, and my massage now has the flow I was looking for, the connection I was looking for with the receiver. It has METTA! Thanks again for your great work and for sharing your experience with those of us hungry to learn."